Renewing your certification demonstrates your continued support of the field and ongoing development as a professional. Renewal is completed every two years and must be completed before the anniversary of the certificate issue date for a certificate to remain active. Renewal of Entry, Associate, and Professional Level Certifications is completed on a two-year cycle. Professional Level Certifications no longer require renewal on a yearly basis. Practitioners who renew their certificates within the renewal period (before the anniversary date of certificate issue) for two cycles (4 years) will be granted permission to complete the renewal process without submitting supporting documentation. These files will be randomly audited. Permission to engage in the simplified renewal program will be granted through an email from the CYCCB Office when two complete cycles have been appropriately completed. A $50 late fee will be charged for any certificates renewed after the end of their renewal period. This will go into effect September 1, 2018 following an amnesty period where renewal of any certificates will be allowed without additional fees. Renew online or submit the renewal form (432 kb pdf) with the renewal fee ($35 USD for Entry & Associate Levels; $50 USD or $66 CAD for Professional Level). Below are the continuing education and professional engagement requirements to be submitted with your renewal. These apply to all certification levels. Renewal requirements include (a) documentation of 30 hours of continuing education in at least two of the five competency domains or (b) documentation of completion of two of the eight alternate activities listed below. 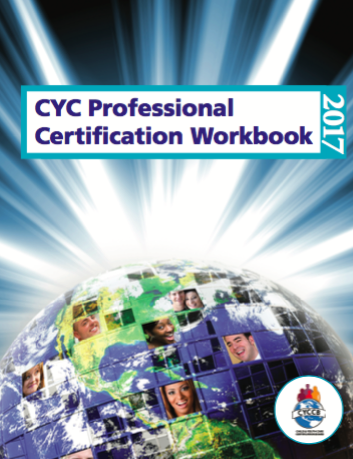 Reviewing the Competencies for Professional Child & Youth Work Practitioners (2010) can help determine in which domain to claim a professional development activity. Certificates issued by the training provider that do not split the content into multiple competency domains can only be claimed in one competency area. Provide proof of professional engagement through membership in a professional association or document completion of two of the eight alternate activities listed below. Alternate options can be used to meet both continuing education and/or professional engagement requirements. To receive credit, activities from at least two of the eight areas described below must be documented (a total of four areas if used for both continuing education and professional engagement). Training and education classes/courses that you taught can only be counted once in each 2-year reporting period. These can be submitted again in a subsequent 2-year period if the class/course was again taught during that time period. The activities must include at least 30 hours of activity. The same activity may not be submitted as demonstration of both Professional Engagement and Continuing Education simultaneously.